Instant Imprints Vancouver Main St. | Custom T-Shirts, Embroidery, Signs and More! At Instant Imprints Vancouver on Main Street, our customers come to us when they want to be more visible to their customers. We create that visibility five different ways: Branded Apparel (embroidery), Signs & Banners, Promotional Products, Custom T-Shirts and Print Services. Is your business looking to ramp up its impact on prospective customers? Look no further than Instant Imprints, the best promotional materials provider in BC! Whether you’re looking for custom t-shirts, printing services, promotional products, custom banners or branded embroidery items, your Vancouver Instant Imprints has all you need for a more visible business. Our local Image Experts are here to assist you from initial design to final print, and answer any questions you have in a timely matter. When you need world-class promotional products with the attention to detail of a local print shop, come on down to Instant Imprints on Main Street to take a big step toward a better business. Branding custom promotional items such as water bottles, keychains and hats is a great way to integrate your brand’s values into the daily lives of your prospective customers. You can cater directly to your clientele to ensure that your items are practical and effective. For example, if you are a tech company, perhaps branded USB sticks are the way to go, but if you’re in the fitness field a branded towel may be better. By choosing promotional products that are relevant to your customer’s lives, your brand can become an important part of their day-to-day. If you’re looking to decorate the Vancouver skyline, or if you’re just looking for a sidewalk sign to invite passersby, Instant Imprints has the skills and supplies to make you a perfect custom banner or sign. 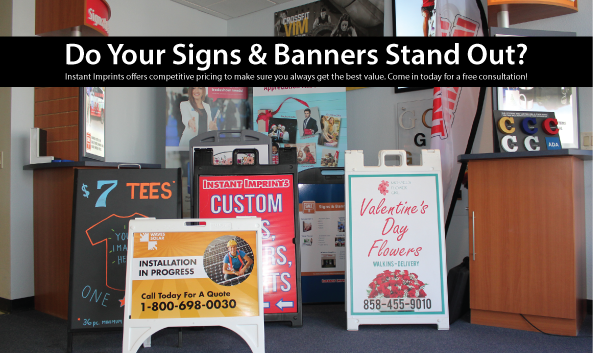 With a wide variety of design options, materials and sizes available, you can craft a custom banner that stands above the competition. Throughout BC and beyond, you’ll find that there’s no better way of bringing your logo to the masses than a professional custom banner. When you’re ready to take your brand visibility to the next level, stop in at our Main Street showroom, give us a call at (604) 558-1877 or request a quote online today!